Derek Gentry: iPad, iKindle, iTwinkie? Amid all the iPhone 4 blah blah blah at Apple's Worldwide Developer Conference last week, CEO Steve Jobs somehow forgot to mention the biggest, most magical Apple news of the year: Here Comes Your Man is now available in the iBookstore! And for just $2.99! Yup, you heard right—$2.99 for 89,134 of my favorite words (with a few repeats) in electronic form. 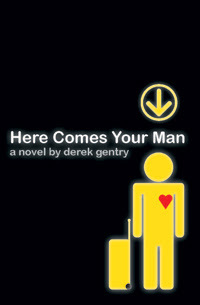 If you're as concerned as I am about maintaining the delicate balance of the e-book universe, you'll be relieved to know that I've simultaneously lowered the price of the Amazon Kindle edition of Here Comes Your Man to $2.99 as well. Why so low? Well, I'm about to embark on a small advertising campaign, my first real effort to market my book to people who don't already know me (or my wife, or my daughter). Printing costs prevent me from pricing the paperback more aggressively than I already have, but electrons are cheap. My hope is that offering an inexpensive e-book will allow readers to try an unknown author like me with very little risk. Of course, e-books themselves are still unexplored territory for many readers, which is probably one reason why Amazon offers free Kindle apps for Windows, Mac, iPhone/iPad, and Blackberry devices. If you’re even a teensy bit curious about e-books, you can download the Kindle software (pictured below) and test-drive the experience without buying any hardware. I'd probably never throw a $500 iPad across the room, no matter how Frisbee-like it might feel. But then again, this guy put one in a blender, so who knows? I had forgotten about the Accidental Tourist and Anne Tyler, I really loved reading it. I'm going to have to discover the local library. So far, I have resisted the e-reader, but I admit to being incredibly jealous when Joe whips out his phone to read. His carry-on is lighter and when he's finished he can just download another cheap read. The Accidental Tourist is one of my all-time favorite books. The movie was pretty darn good too--a rare case of a great book surviving the translation to film! 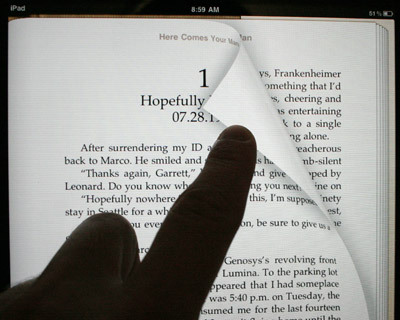 My feelings about e-books are still messy and unresolved. As a computer geek, I think the technological aspect of them is cool, but as a former English major with a big library of paper books, I feel like I'll always want to possess a tangible copy of anything I really enjoy. And there's something far less peaceful about the process of reading on any electrical device vs. paper. It'll be interesting to see how it all shakes out, especially once the Kindles etc. drop to around $99, which can't be far off.